Wait, Smoking Makes You Earn Less Money Too? So tonight I was casually scrolling my Instagram feed, and it was pretty much the usual. Girls that I know were sticking their butts out while they take pictures with their friends, all the golf trick shot accounts I follow were posting mind blowing videos of people doing things I didn’t even think were possible using golf clubs and golf balls, and all of my hippy friends were posting nature photos from their latest hikes. Then, I came across something that didn’t seem quite right. It was an advertisement from the anti-smoking group, Truth, about the dangers of smoking. But rather than lament lung cancer or the amount smokers pay each year to feed their nicotine addiction, it spoke of a smoker’s wage gap similar to the so-called gender pay gap. These folks claimed that smokers make 20% less money per year because they smoke. It seemed a little far fetched to me, so I decided to do some investigating into their claims. The null hypothesis in this case would obviously be that smokers make the same money as non-smokers and the alternative hypothesis is that smokers less money. While I was unable to find the exact data that lead to their claim that smokers make 20% less than nonsmokers, the CDC website states that about 26% of adults who make less than the poverty line smoke while only 15% of adults not living in poverty do so. So obviously there’s something going on here with smokers and their disproportionately low incomes. Next I decided to look to some other possible explainers for the data besides direct causality between smoking and making less money. Reverse causality, that making less money may cause an individual to smoke, has a place in this discussion. The Health Literacy Special Collection mentions that for some, smoking is a means of stress relief because they have personal or financial problems. This environmental stress then makes it harder to quit smoking, according to the CDC. There could also be confounding variables in play. Also based on CDC statistics, those who have an associates degree and higher are much less likely to smoke than those who have a high school diploma or less. Obviously, those with lesser education tend to make less than those who have pursued more advanced degrees. A possible mechanism for the discrepancy in smoking related to education could be that more educated individuals know better the effects of smoking and will avoid it. Time also reported that workers in the construction, mining, and hotel and foodservice industries, not particularly high paying jobs, smoke the most, all three of those hovering around a 30% rate. Some of the jobs where smoking is least prevalent are business management, finance and insurance, and science and tech fields, all with rates between ten and fifteen percent. The discrepancy here could also be due to the relative education levels of those with certain jobs or it could be due to the culture within these occupations. For example, construction workers spend all day outdoors and thus have more opportunity to smoke on their breaks while business managers spend all day in offices with no smoking policies. In conclusion, while there seems to be something Truth’s claim that smokers make less money, there doesn’t seem to be enough evidence to back up the idea that smoking in and of itself is what is hurting smokers economically. This entry was posted in Uncategorized on October 18, 2016 by Tyler Olson. In the grand scheme of things I feel as though smoking has no relation to your yearly salary. Smoking is a terrible habit and addiction to get into but the reason why it may seem like its effecting yearly salaries is because of how expensive each pack is. I remember talking to my father about how much a pack of cigs was when he was my age growing up… now back in his day in was common for everybody to smoke and even worse, unfiltered cigs. My dad said cigs per pack were less than a dollar and you could buy them basically if your head was over the counter os around 16-18 years old. Cigarettes now are extremely expensive and have sky rocketed since back in the day costing about $10-$12 per pack. I think saying that smoking and yearly salary is stereotypical and not relatable. The only reason cigs hurt your salary is buying them due to the fact that they are so expensive per pack. The fact that people who smoke make less money than those who don’t smoke makes a lot of sense. Many of the side effects of smoking, such as yellowing of the teeth and a stronger odor, would have a negative effect on someone that is going into an interview for a job or free lance work. Also, as mentioned in the post, there are certain confounding variables that could be taken into consideration when looking into the difference of pay, such as the fact that 1 in 5 African-Americans uses methanol cigarettes which is almost 3 times as much as Caucasians. All of these facts and many more can be found through this link http://www.lung.org/stop-smoking/smoking-facts/tobacco-use-racial-and-ethnic.html if you care to look into this topic further. This is a very interesting post. As a smoker every time I see that commercial on T.V I usually respond with something along the lines of “this theory is BullS%*#T”. Although I did never think of it in the manner of lower income employees are more likely to smoke than higher income employees. During my low paying part time high school delivery job I used to smoke just to simply pass the time. It makes sense that someone stuck in that position full time continues to smoke will still be making near minimum wage. I believe the commercial is misleading, it needs to be better worded because the way it is portrayed now it sounds like smokers make less than non smokers working the same job. this lead me to look on how much smoking can actually cost you, here is a great article on the true cost of smoking. I thought that your post was interesting as well. 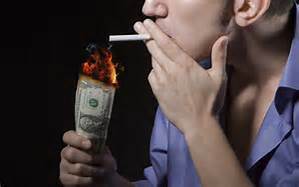 From reading your post I now realize how much money people loose because they smoke. It’s interesting to me that they would pay do something that is harmful to their body and all the while loosing money because they have smoke a cigarette. I have a relative who smokes so it is hard to see her harm herself from smoking. Here is an article about smoking and the cost smoking. It even includes a calculating tool to figure out how much they are spending in a week on cigarettes. Tyler- this article was very interesting. Over the summer I worked with a lot of people who smoked. It always bothered me when they would take their “smoke breaks” every few hours. While I stood at a cash register for hours on end, my fellow workers were receiving breaks just so they could go do something harmful to them and smoke a cigarette. I wonder if that is why they get paid less- maybe once employers see an employees smoking habits, they take into consideration the fact that they will take more breaks than the average worker and therefore get less stuff done. Just a thought. This is a great article about the impact of being a smoker and working- http://www.nbcnews.com/health/health-news/smokers-less-likely-get-hired-earn-less-study-n554321. Enjoy!